Ian Bogost has been reading a lot of Imagist poetry (Pound, Williams), and was thinking about things to do slowly/instantanously. 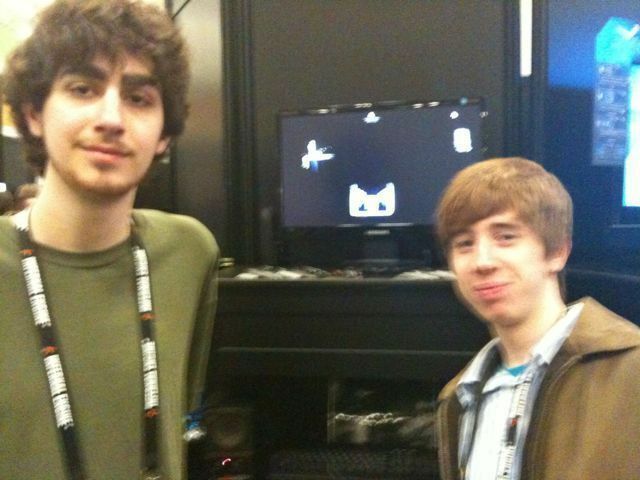 Also, he had been teaching people how to make games on the original Atari Console (that’s a 2600 to you youthy lot). He was struck by the parallels between making 1k games and Haiku. So, his 4-game cart about the seasons. In the winter one, you sit at a table and drink coffee. And a picture of the whole team, with their trophy. Sid Meier is giving the GDC main keynote at 10:30 today. Firaxis is everywhere. 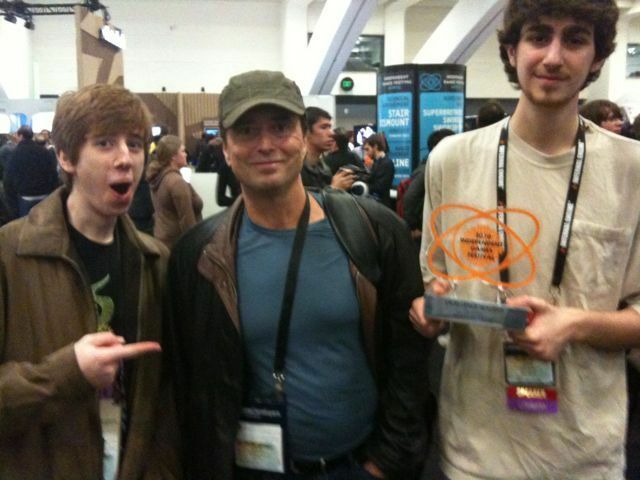 Jon and Closure won at IGF. Sure, San Francisco. Sure, Seattle. Baltimore too. The Swag! OMGoodness, the Schwagg! They’re throwing t-shirts around like confettii. I’m going to be mowing in style for 15 years. I’ve got pens, lanyards, hand sanitizer, bonky balloon things, styrofoam airplanes, a zillion chances to win an iThingie (declined). Kit-kat? Yes thanks. And the Queen of all Schwag For the Rest of the History of the World: Google gave me a FRAKKIN DROID. A honest-to-Pete Smartphone. WITH FREE ACTIVATION. I haven’t read the fine print, but the rumor is that it’s a 1-YEAR PLAN. I had heard about it, and was pretty sure it was one of those “YOU MAY HAVE WON A TRILLION DOLLARS oh, sorry,” but no, bang, Droid, in my hand there you go next please. Wonder if MD will let me keep it– I am employed by the state, after all. That would be disappointing. So, is this a sign of economic resurgence, industry implosive doom, industry explosive mayhem, or just trying to keep up with Google. 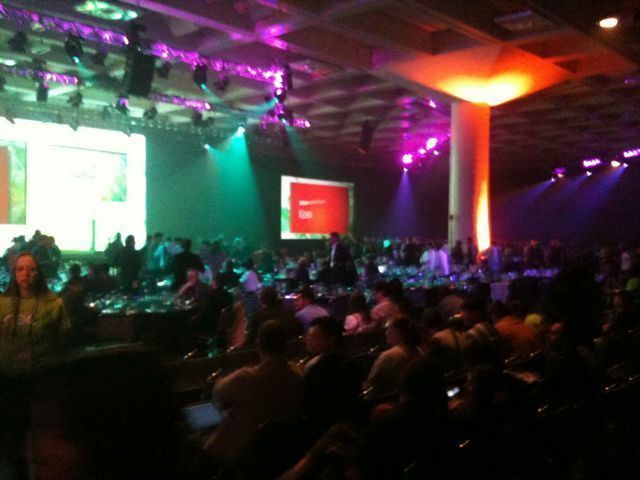 I haven’t seen anything like this since SIGGRAPH ’95. SIGGRAPH 2004, I scored a postcard, but I had to give a blood sample. I’m thinking explosive mayhem. iPad, Windows 7 Mobile, Sony is offering dev kits to everyone. Basically, it boils down to logical self-consistency and backstory. (Well, why did the “Star Wars” franchise just implode? George got too lazy to keep his own made-up facts straight.) When RAS makes a new world, his standard of backstory excellence is 10,000 years of world history– most of which will never be published, except as telling little details. 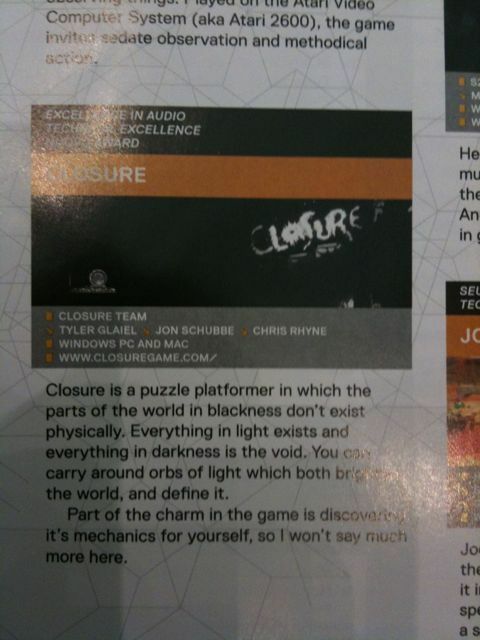 “Closure” by Jon, Tyler Glaiel, and Chris Rhyne just won the “Excellence in Audio” award at the Independent Games Festival. They were also finalists in the “Technical Excellence” and “Nuovo Award” categories. Hearty congratulations to the Closure team for this wonderful achievement! … consisted of screenwriting basics and improv exercises “Stories have conflict. They resolve the conflict.” Fun, but I can get that at the library. Man, that room was packed and hot. 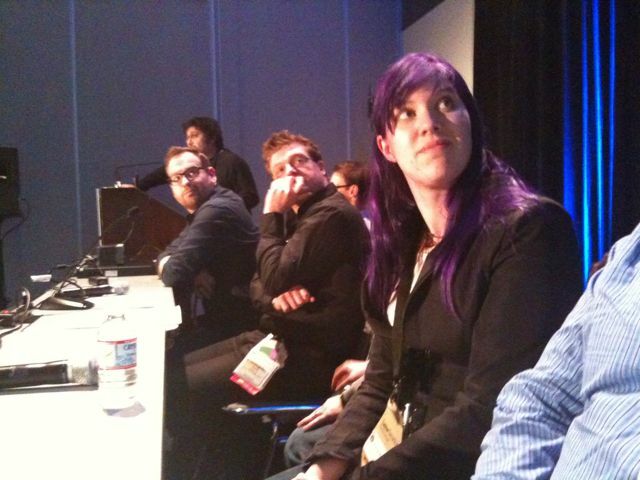 Here’s a photo from the podium of the “Global Game Jam Blasts.” Sean Duncan is in the glasses. I presented my take on UMBC’s jams. Some people just presented their own games. Link to slides later, but know that if you submitted a game at UMBC GJ, your name has now been up in lights. CTA is set of analysis tools for expertise. Expertise (in this framework) is knowledge that can be applied to a problem. CTA provides methodology for describing and classifying problems and how easily a particular expertise can be applied to them. 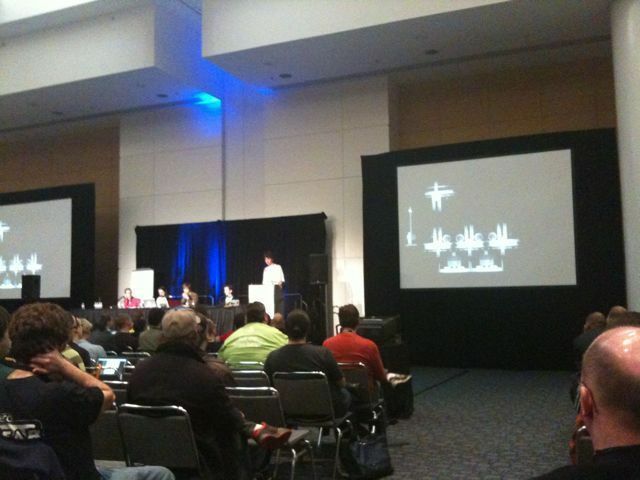 The talk was about applying CTA to games along with playability considerations. The game is always “how to apply expertise X”, and you make a bunch of problem scenarios into which the expertise is more-or-less-successfully applied. If the game gets boring, make the problem not fit the expertise as well (“well-formed problems” vs “poorly-formed problems”). Jargon note: “Serious Games” at GDC embraces both “Art Games” and “Simulation Games.” The former are made to be presented to boutique or gallery audiences as content, and the latter are a form of training exercise. That is an enormous scope, and I have been confused by it. Art games go back at least to Dada, but they tend to be in service to polemics or process– Duchamp, Dada, Fluxxus– good art making a point, but not play-tested, not playable, and very unsatisfying as games. Simulation games are a billion-dollar industry that go back to the Franco-Prussian war– think tank battalion training exercises. Strange two things to lump together– art and war. But they are certainly serious.